Style Master: all the tools you need to design, build, code, troubleshoot and learn standards based web design using cascading style sheets. Beyond the basics, working with CSS can get tricky. Exactly which CSS styles a particular part of my page? Which parts of a page are styled by a particular statement? 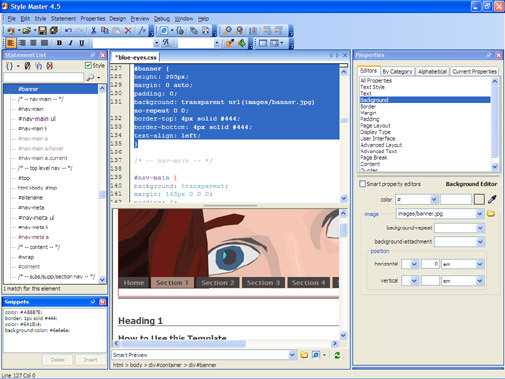 Style Master's Design Pane and X-Ray features are designed to answer these questions for you intuitively and visually. 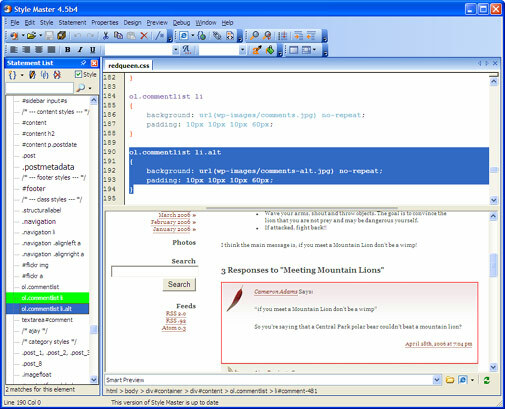 The Design Pane is a unique and extremely powerful tool for creativity, productivity and understanding the relationship between a style sheet and an HTML document. Click any part of a web page, and see which statements in your style sheet apply to it. 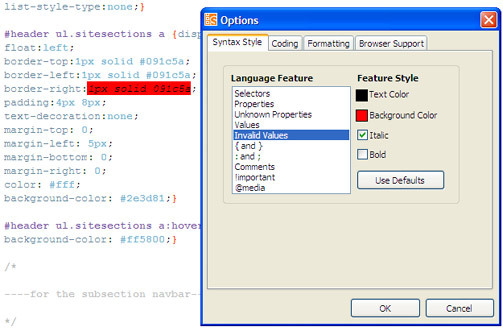 Click any part of a web page to edit its style, either with our editors or by hand coding. 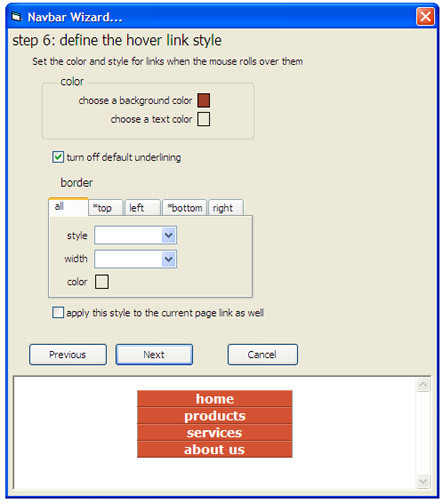 Create a new statement for any element in a web page with one click. Click in any statement in your code and see which elements on a page are affected by it. Use the X-Ray to instantly see the structure of your layouts (such as which elements are absolutely positioned or laid out using the float property). Sit back and let Style Master do it all for you - creating statements for every type of element in your page, even importing legacy style like font tag properties, and turning them into standards ready CSS. Working with CSS is about to get a whole lot more productive and enjoyable. A Style Master template is a great way to kick start a design - and they're all 100% valid web standards XHTML 1.0 and CSS. One, two and three column layouts, with and without images: you're bound to find just the thing you need. Imagine: all the CSS, all the HTML and all the images ready to go. All you need to do is add your own content, and maybe tweak the style to your needs, and you can have a site done within the hour. Style Master features a number of Andreas Viklund's beautiful, award winning templates as well as a brand new template he designed especially for Style Master. Talented and award winning web designer and musician Andreas is an enthusiastic Style Master user. You can't get much better an endorsement than that. The full version of Style Master now comes with over 40 stylish templates: buy now for $59.99. 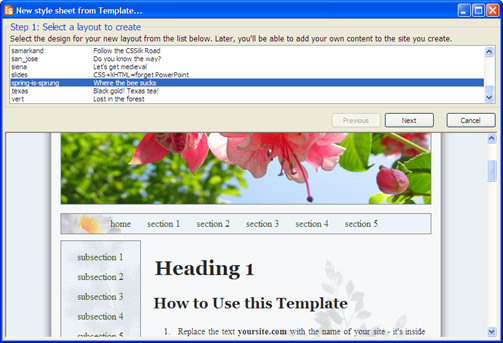 Templates marked with a * are also available with the demo version of Style Master. While browser support is good to excellent for CSS in current browsers, you're still going to find yourself having to deal with older, more buggy browsers like Internet Explorer 5 and 5.5. 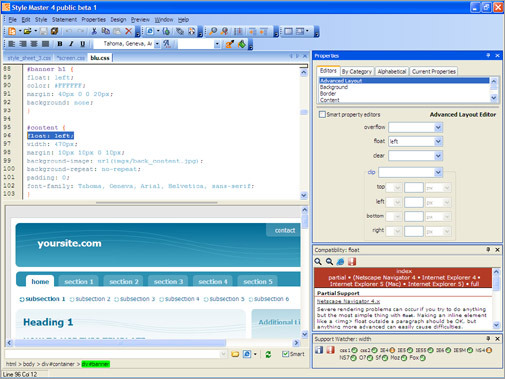 The Style Master Support Watcher can be there on screen for you all the time, letting you know what is and isn't available in which browsers and specifications, and warning you about dangerously buggy support. Style Master also includes detailed compatibility reports for every CSS feature in all browsers of any importance (from Internet Explorer and Navigator 4 onwards) so you'll be in a position to make the best possible decision every time when it comes to targeting browsers. The new version of Style Master was so exciting and new we had to re-write the famed hands on tutorial to make sure it would show you your way around the new features. It still comes for free as part of the demo download. If you're new to CSS, or you've seen a little and want to consolidate and move to the next level this is an ideal place to start. You get to build a very nice looking site using all the latest techniques for text styling, page appearance and multi column fixed width layout and along the way you'll learn not just about CSS but a whole host of essential techniques for accessibility and standards based web design. Download the demo and check it out today. Along with our browser compatibility info, we also include a comprehensive reference to every aspect of the CSS specification built into the application. So don't worry if you never want to look at a technical specification again: with Style Master everything you need to know is right there. As part of our courseware collection we created our famed Complete CSS Guide: a reference to every aspect of CSS including explanations of how it actually works, all the properties and all the selectors. Usually $US24.99, we give you a free downloadable copy with every purchase of Style Master, just $US59.99.